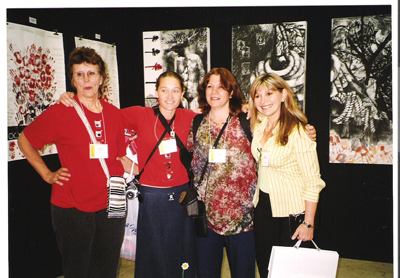 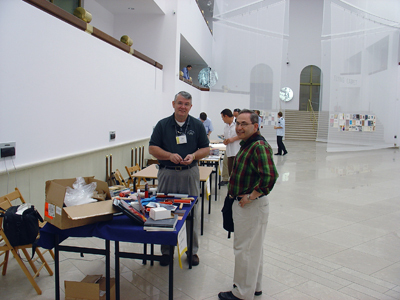 during the week prior to the conference. 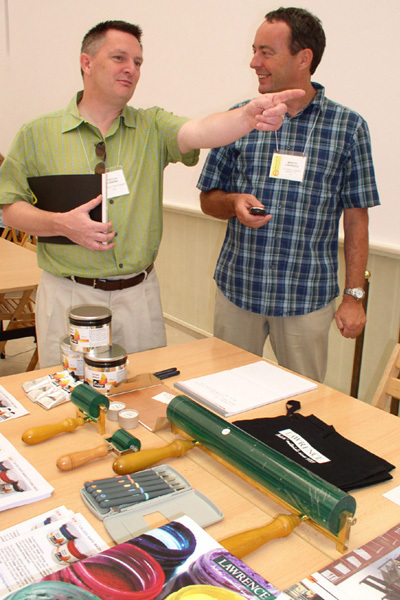 The conference portfolio given to each delegate included a 166 page printed program with abstracts and biographies on the conference presenters and numerous other resources (such as show cards, maps, guides and periodicals). 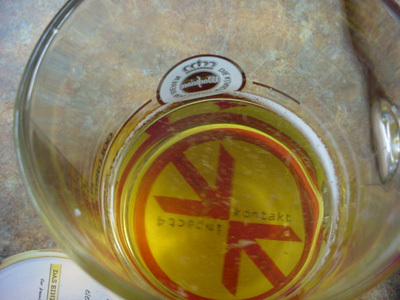 The IMPACT conference coaster serves its function at the pre-conference happy hour on Sunday. 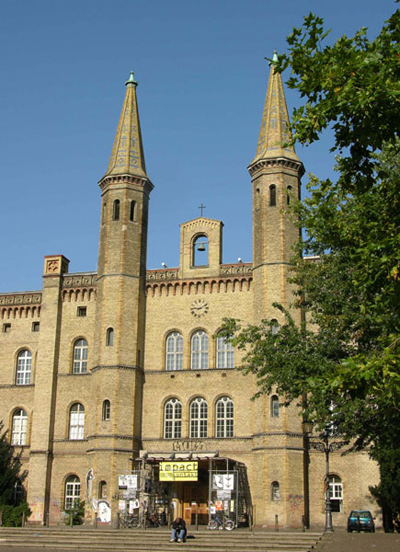 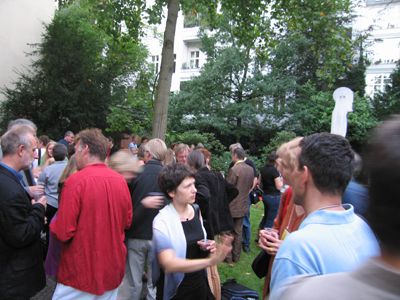 The conference began on Monday at the Druckwerkstatt, Kulturwerk of bbk berlins in the Kunsterlerhaus Bethanien. 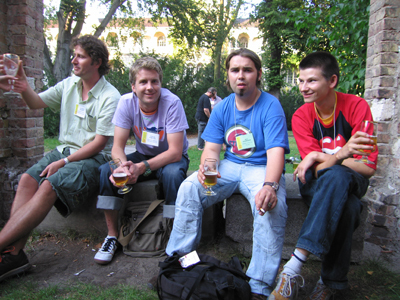 pause during their work on the Demographics Project. 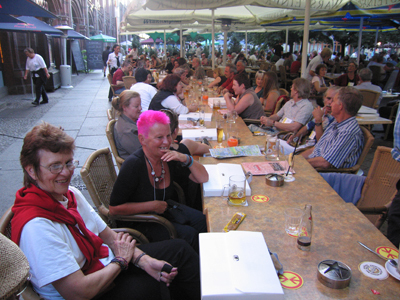 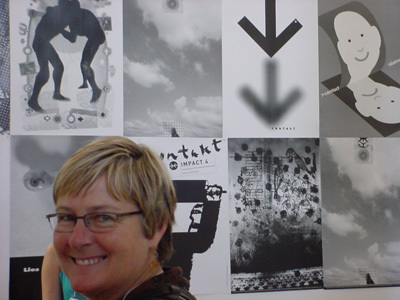 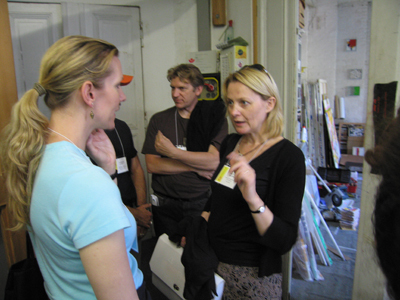 Patricia Olynyk, Krzystof Molenda and Grazyna Halasa meet at 1x2 Siebdruck in Kreuzberg. 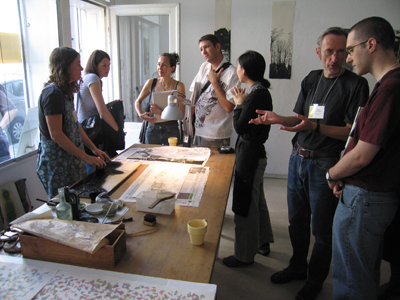 A relief printing demonstration at Druckstelle in Berlin. 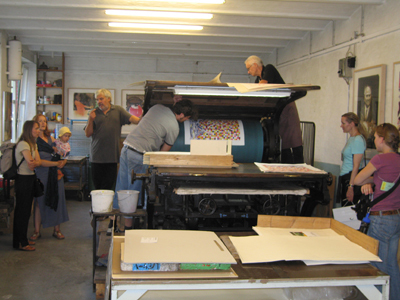 A lithography presentation at Tabor Presse in Berlin. 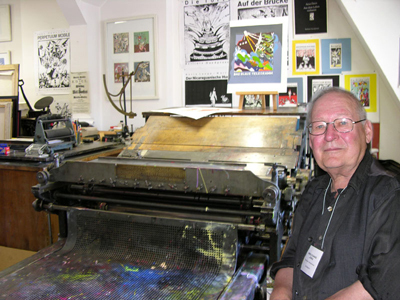 Wolfgang Jorge of Berliner Handpresse. 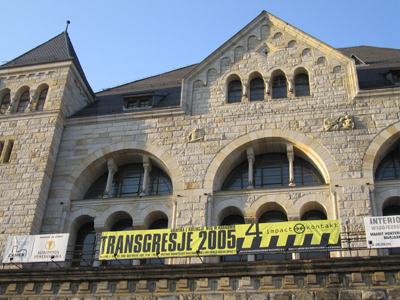 Druckerwerkstatt Kulturwerk of bbk berlins. 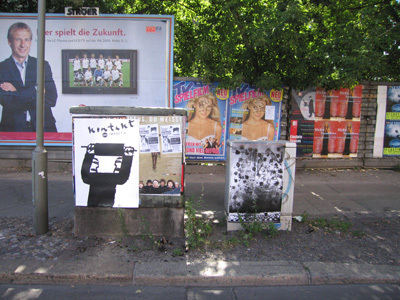 IMPACT conference offset posters on the streets of Berlin. 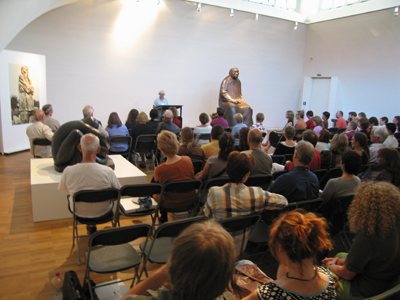 Dr. Gudrun Fritsch addresses the delegates at the Käthe Kollwitz Museum to mark the presentation of the "Homage to Kollwitz" portfolio organized by Beth Grabowski. 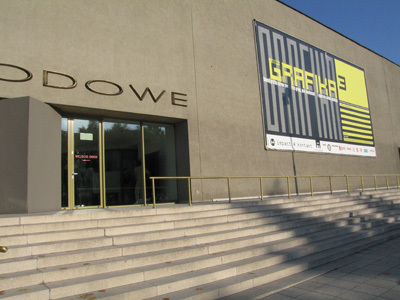 at the Käthe Kollwitz Museum in Berlin. 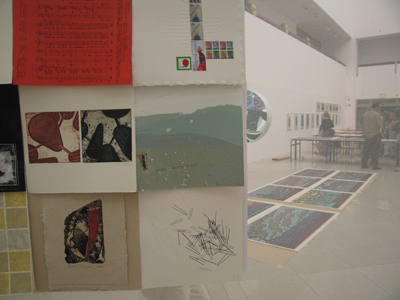 on display at UdK in Berlin. 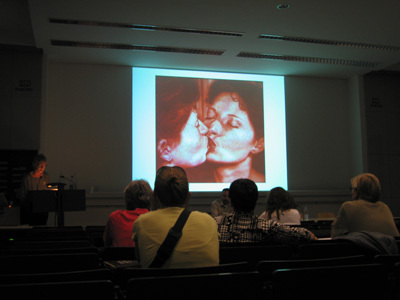 Portfolio presentations at UdK in Berlin. 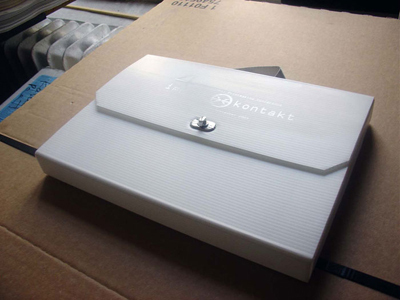 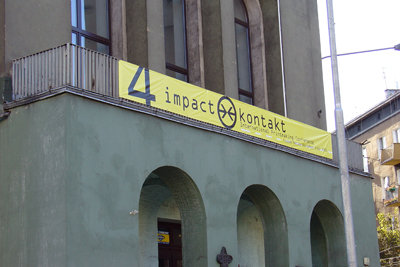 IMPACT women are also "Proud Survivors"
"Kontakt with the Book" session on Tuesday at UdK. 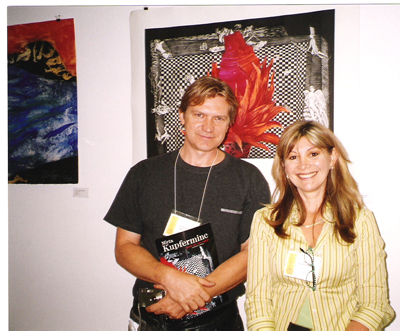 Arunas Gelunas and Jana Harper. 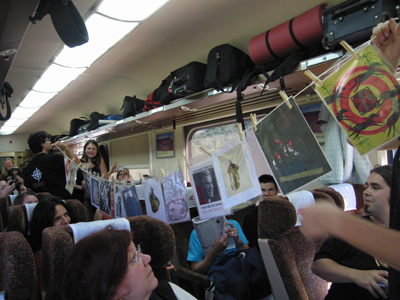 an extra train ticket to Poznan. 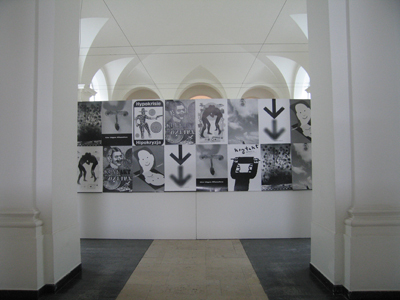 from the Norwich School of Art. 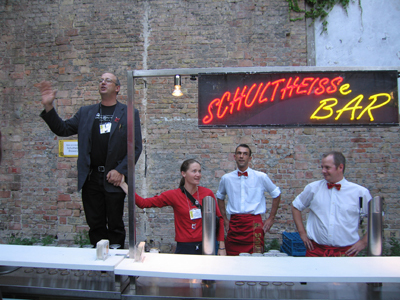 Enjoying the excellent beer donated by Schultheiss Brewery. 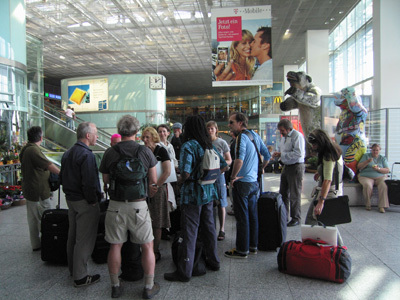 Wednesday before traveling to Poznan, Poland. 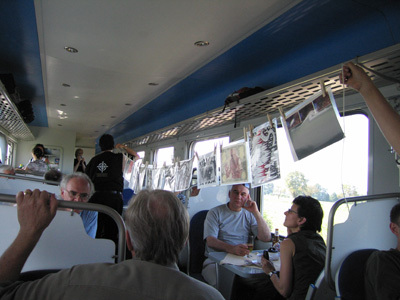 on the train from Berlin to Poznan. 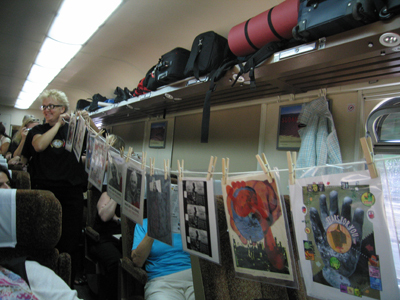 The "Moving Targets" portfolio goes to the dining car. 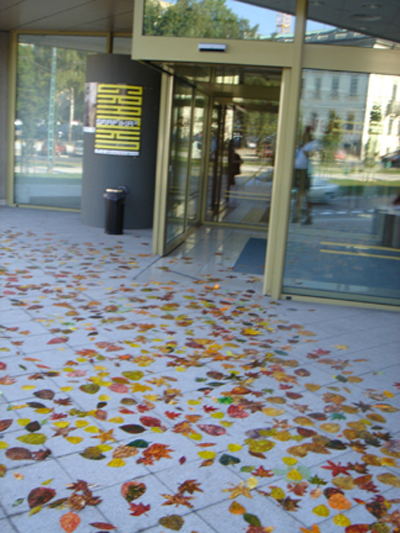 The Zamek Center for Culture in Poznan. 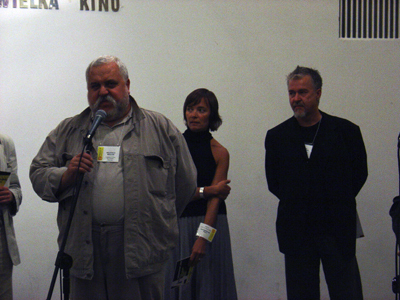 Professor Müller, Rector of the Academy of Fine Arts, Poznan addresses the conference delegates before the opening of "Trangressions 2005." 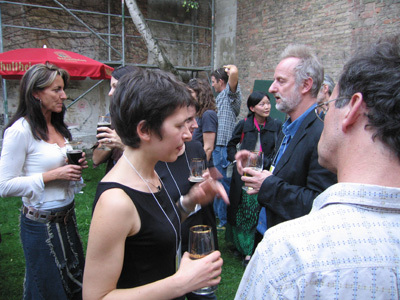 Marek Raczak (Director) and Anna Hryniewiecka (Program Director) of CK "Zamek" Center of Culture. 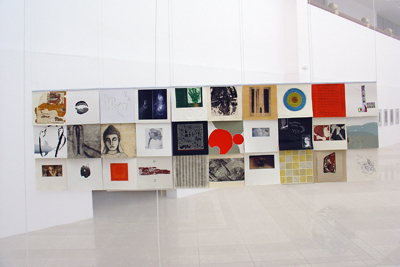 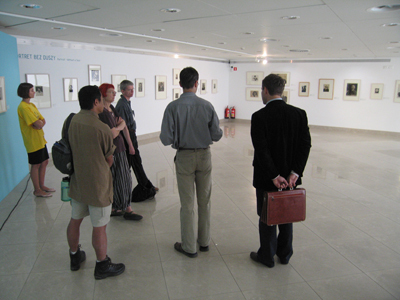 "Transgressions 2005" an exhibition of Polish prints from the past decade on view at the Zamek Center for Culture. 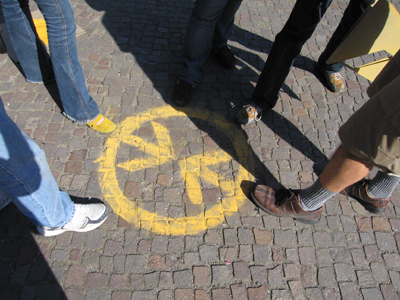 on the steps of Zamek. 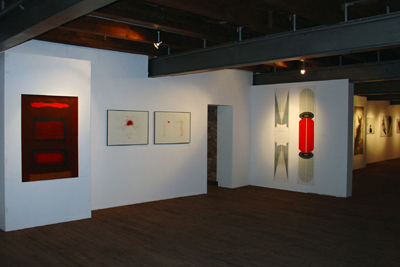 Mirek Pawlowski's exhibition at the Profil Gallery at Zamek. 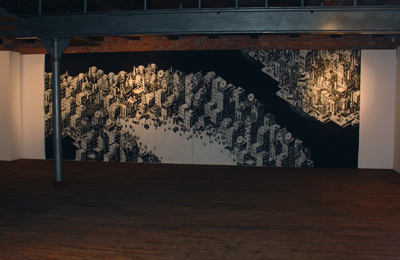 with a banner designed by Mirek Pawlowski. 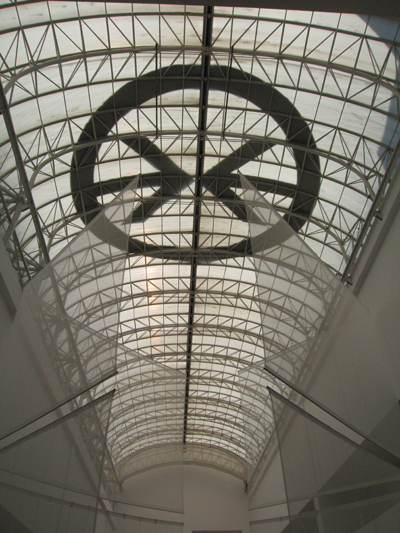 of the National Museum in Poznan. 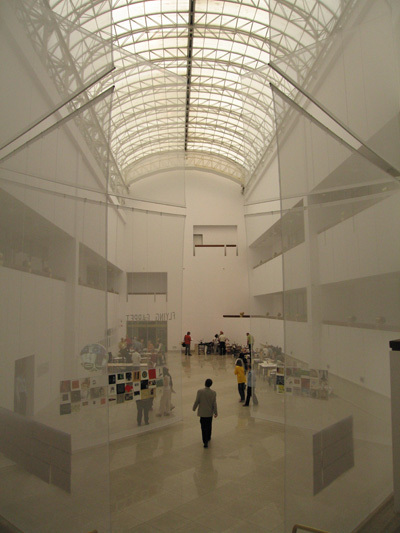 The Patio Hall at the National Museum of Poznan served as the location for the product fair, exhibitions and portfolio presentations. 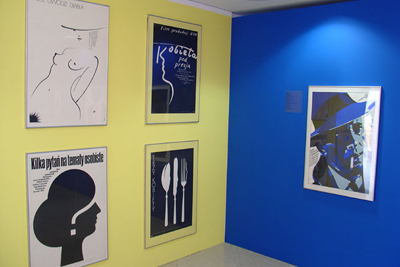 Exhibitions in the Patio Hall at the National Museum of Poznan. 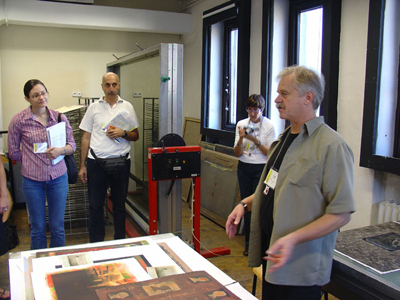 and Mark Pascale of the Art Institute of Chicago. 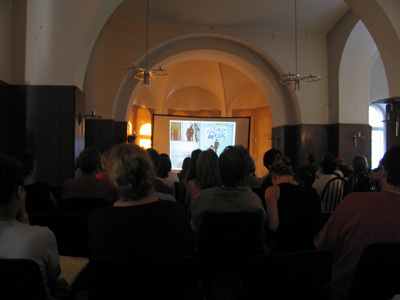 talk during the product fair. 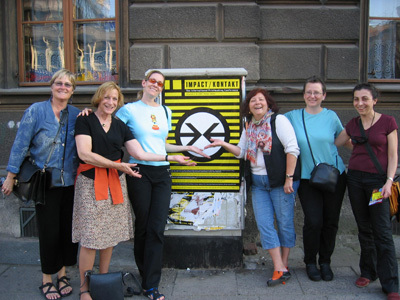 On the streets of Poznan, Poland. 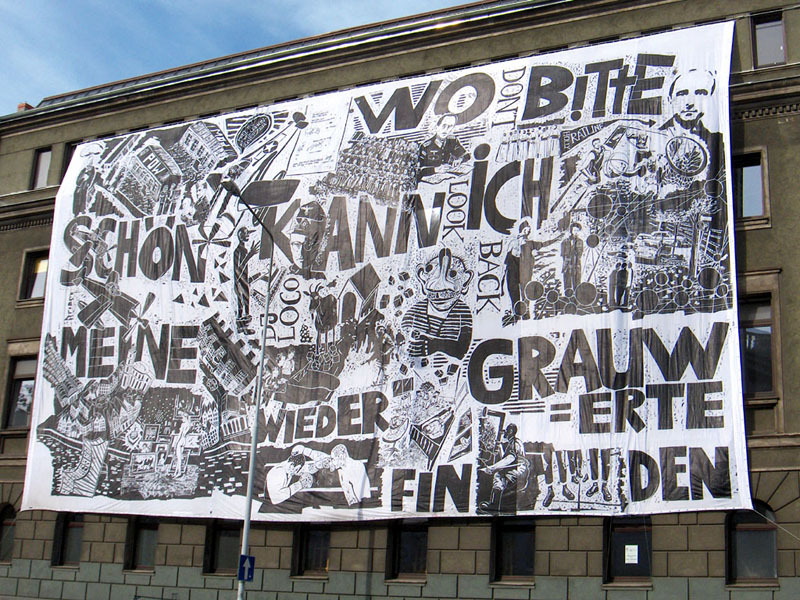 Thomas Kilpper's hand-printed woodcut banner (12 x 22 meters) "Don't Look Back" installed on the Art Academy of Poznan. 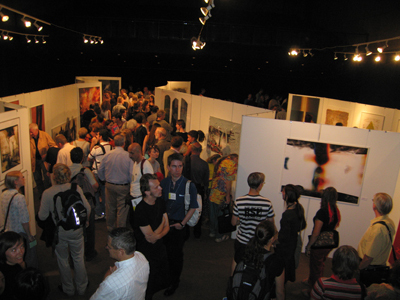 The presentation of this work was supported by the Institut fur Auslands-Beziehungen. 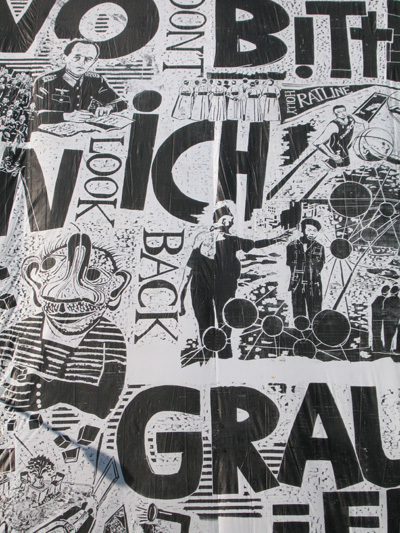 Detail of Thomas Kilpper's "Don't Look Back." 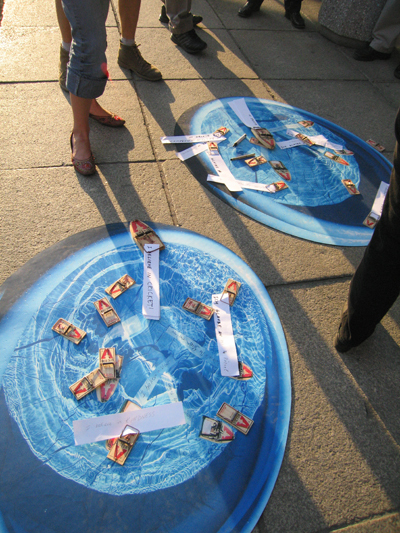 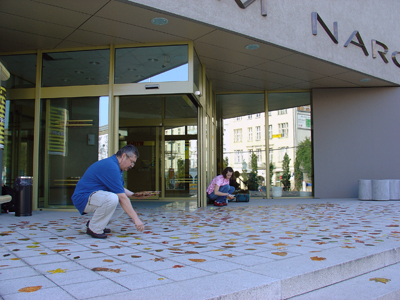 Xenophon Sachinis' print installation “The Hidden Dimension of Printing” on the front steps of the National Museum in Poznan. 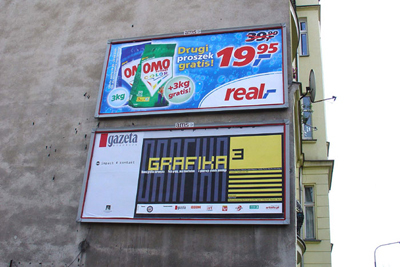 IMPACT conference exhibition billboard in Poznan. 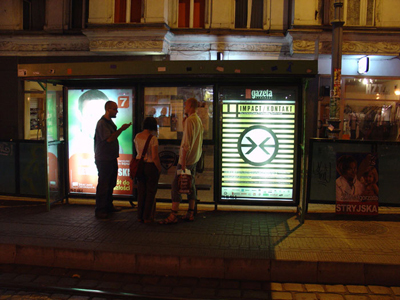 Poznan tram stop with the IMPACT conference poster. 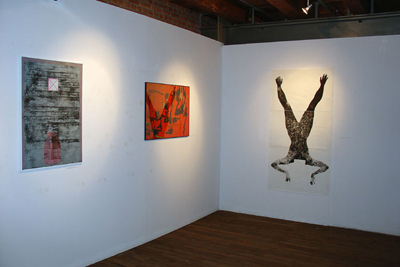 Izabela Gustowska's exhibition "Life is a story"
on view at Galleria Ego. 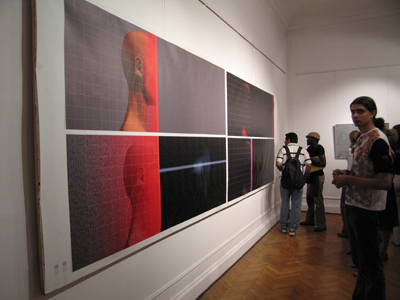 Wieslaw Smuzny's exhibition/performance "21st Century Figuration" at the Arsenal Gallery. 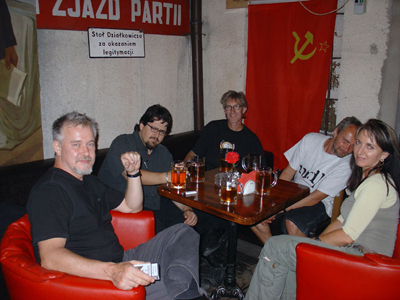 Discussing print theory and politics at the Proletaryat Bar. 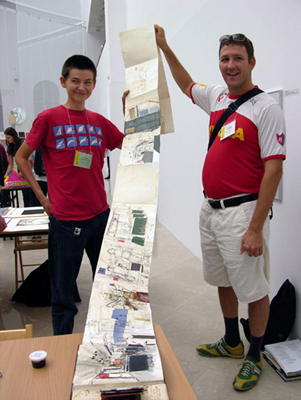 Michal Tatarkiewicz from the Academy of Fine Art in Poznan shows his sketchbook to Daniel Heyman. 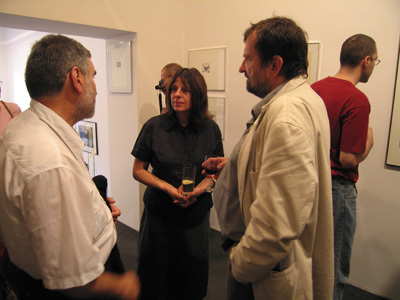 Jan Pamula talks to Anna Sobol-Wegman and Stanslaw Wegman at Galeria Garbary 48 (Poznan Society of Promotion of Art). 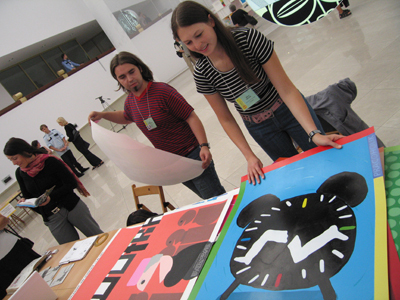 Max Skorwider and Maja Wolna display their work during a special portfolio viewing at the National Museum in Poznan. 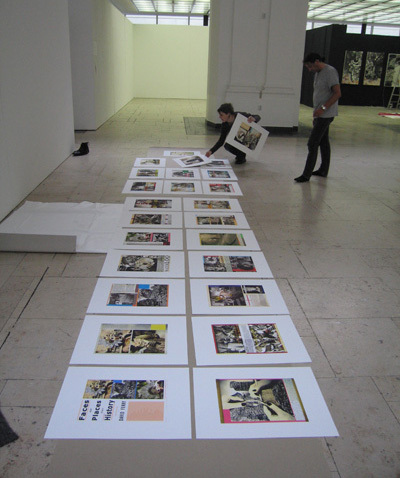 Dennis O'Neil discusses his innovative screenprint methods on Thursday in Poznan. 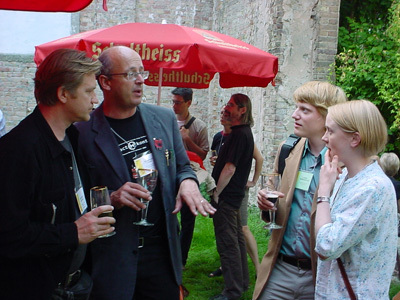 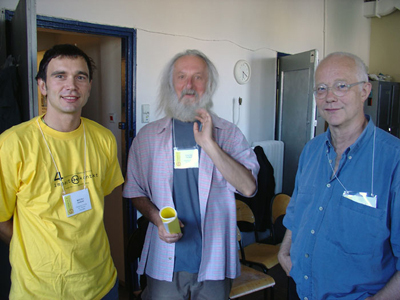 Maciej Kurak, Stephan Ficner and Neils Unbehagen. 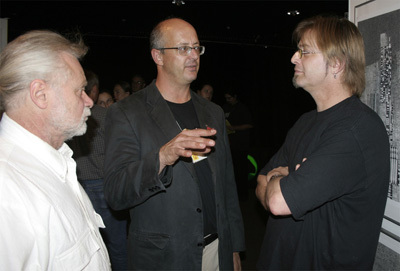 Dan Welden, Beauvais Lyons and Dominic Thorburn. 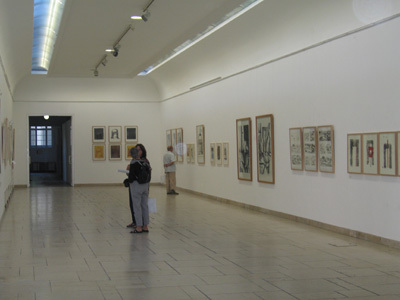 Walking tour of the exhibition "Beyond the Group, Beyond the Manifesto" curated by Agnieszka Salamon and Michal Haake at the National Museum in Poznan. 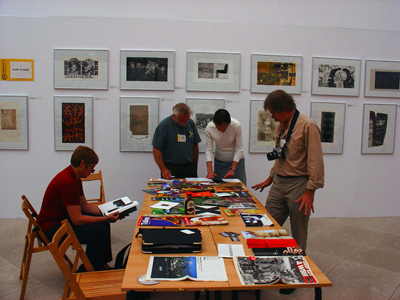 Delegates look over catalogues from Tallin, Estonia. 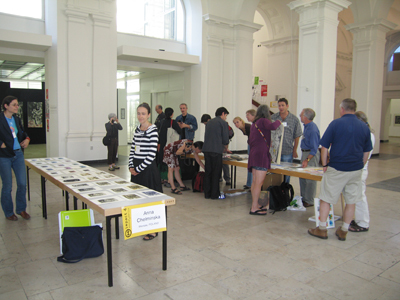 The "Kontakt: Hand to Hand" portfolio organized by Patricia Olynyk is on display on the back wall. 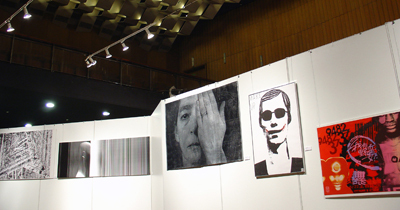 Zdzislaw Szubert at the National Museum in Poznan. 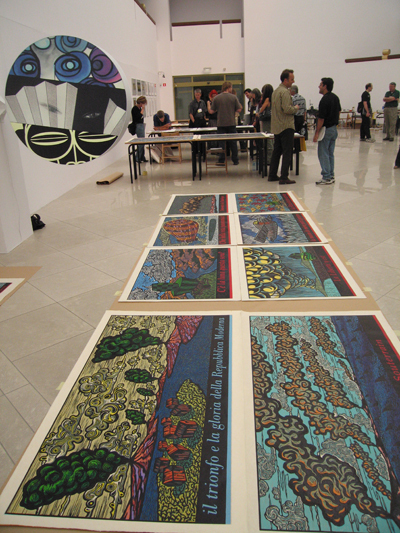 Works from the exhibition "Polish Poster – Individualities of Three Generations"
Forty delegates show their work during the open portfolio session at Zamek on Friday September 9th. 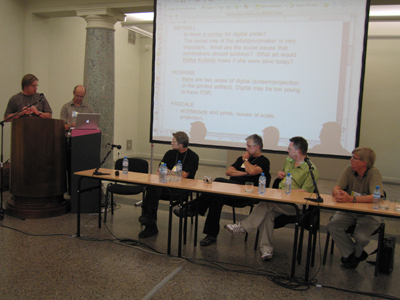 Dominic Thorburn leads the plenary session held on Friday. 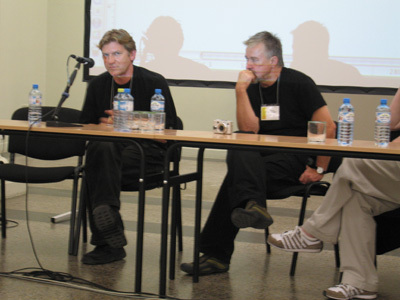 Krzystof Molenda and Mirek Pawlowski at the plenary session. 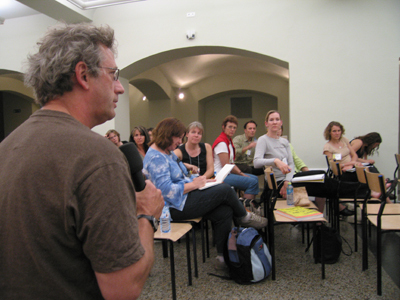 Hugh Merrill speaks at the plenary session. 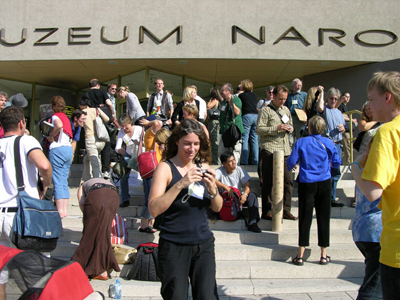 Delegates on the museum steps after the group photograph. 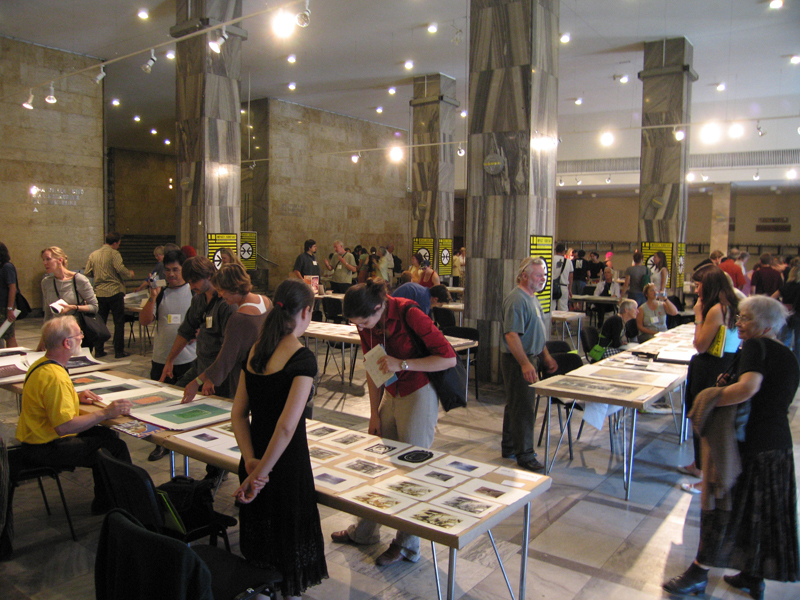 Applause for Grazyna Halasa, Print Curator from The National Museum on Friday evening in Poznan. 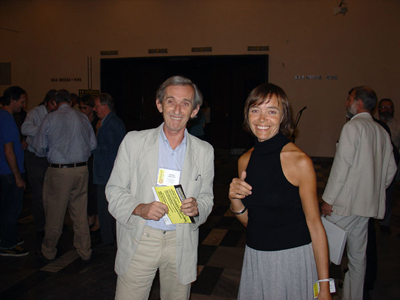 Applause for Professor Wojciech Suchocki, Director of The National Museum on Friday evening in Poznan. 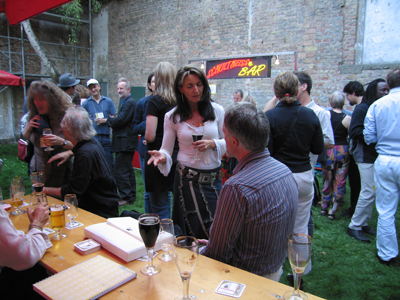 at The Shake on Saturday in Berlin. 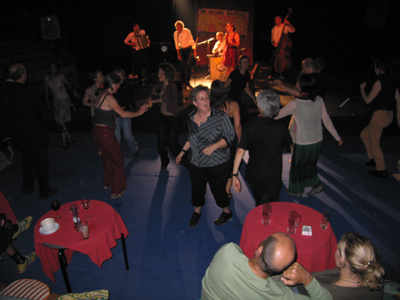 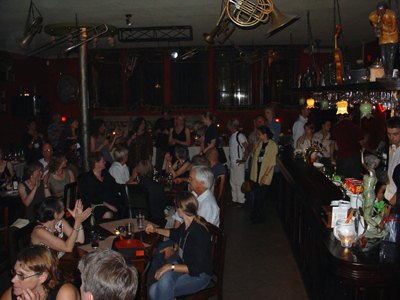 People dance to the music of Die Kleine Kapelle. 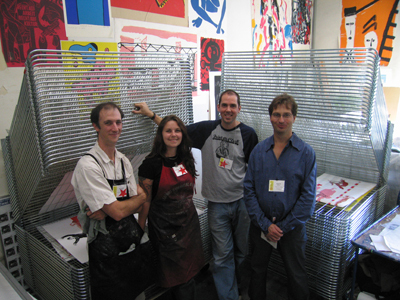 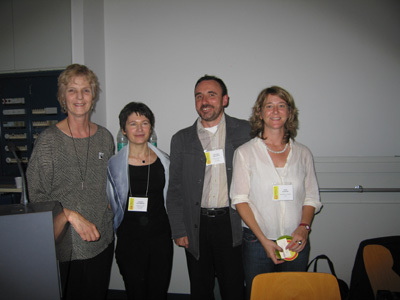 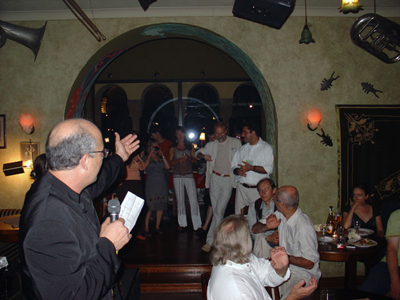 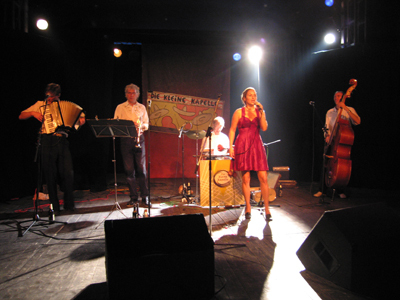 Mirek Pawlowski, Krzystof Molenda, Mirta Kupferminc and Beauvais Lyons.